NAFTA talks are resuming at the decision-maker level sooner than expected, with Canada's foreign affairs minister set to return to Washington on Tuesday. 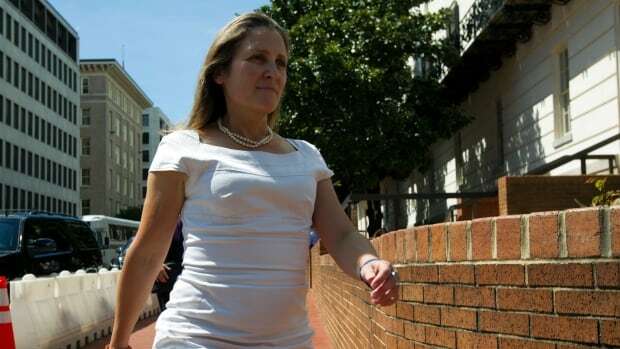 A spokesperson for Chrystia Freeland's office said the minister will be in D.C. for meetings tomorrow before travelling to Saskatoon for the Liberal caucus retreat. She also may return to Washington for more meetings at the end of the week, but that has yet to be confirmed. NAFTA decision makers stepped away from the talks on Friday, while lower-level technical negotiators from Canada and the United States continued to meet through the weekend. When the political-level talks broke off, those discussions were not expected to resume until later in the week because of scheduling conflicts. U.S. Trade Representative Robert Lighthizer was in Brussels on Monday for meetings with his European counterparts about tariffs. A source with direct knowledge of the talks said Canada is eager to secure an agreement soon, adding that getting to a new NAFTA deal will become more difficult the longer talks drag on. The source, who spoke with CBC News on the condition of anonymity due to the sensitive nature of the discussions, also said the Canadian side wants NAFTA talks wrapped up prior to the end-of-the-month deadline set by the U.S. side. But progress behind the scenes has been described by multiple sources as "slow," with several key issues still unresolved. One of the sticking points that is getting the most attention so far is Canada's demand to keep an independent dispute resolution system within the trade pact. The Canadians are demanding that the dispute resolution mechanism Chapter 19, or a version of it, be kept in NAFTA. The Americans want the system scrapped in favour of using U.S. courts to resolve trade disputes. Two senior sources say the U.S. appears to be testing Canada's limits on this position, to see whether it is serious. Prime Minister Justin Trudeau has said publicly that maintaining a dispute resolution system is a bedrock condition for Canada — and even took a shot at U.S. President Donald Trump over the issue. "We need to keep the Chapter 19 dispute resolution because that ensures that the rules are actually followed. And we know we have a president who doesn't always follow the rules as they're laid out," Trudeau told an Alberta radio station last week. Another significant sticking point is the U.S. demand that Canada make concessions to allow American farmers to sell more dairy products north of the border. Multiple sources say the Americans are not satisfied with the compromises Canada has proposed. Sources also say negotiators are not in agreement over proposed changes to the rules for procurement. When the Americans originally put new procurement demands on the table, Canada's chief NAFTA negotiator Steve Verheul described it as the "worst offer ever made by the U.S. in any trade negotiation." Verheul told reporters, it "… would leave us in a position where the country of Bahrain would have far better access to U.S. procurement markets than Canada would, or that Mexico would, and we've clearly said this kind of offer is not possible." Canada is also pushing to ensure it can keep cultural exemptions in a renegotiated deal. Sources say the U.S. has not confirmed whether it is willing to keep the carve-outs used to protect Canadian cultural industries.